The roots of today's feast are found in St. Luke's Gospel, which we have just read. This account describes the first mystery of the Rosary, the annunciation -- and it gives us the text of the main prayer of the Rosary, the “Hail Mary.” The other major prayer, the “Our Father,” or "Lord's Prayer," is also found later in St. Luke's Gospel (Ch. 11) and in that of St. Matthew (ch. 6). 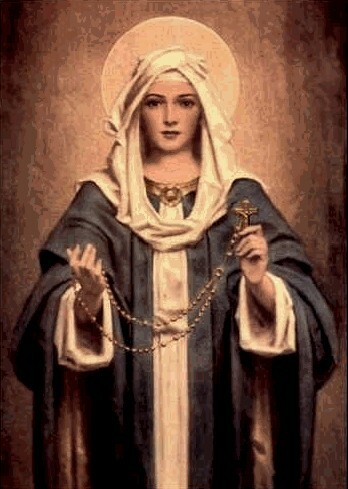 But, of course, this is only the "root" or the beginning, for the Rosary consists of meditation on the major events which took place throughout the lives of Jesus and Mary. It is, as we know made up of three sets of five decades of “Hail Marys” — with each of the sets commemorating either the joyous, sorrowful, or glorious events of our salvation. Perhaps the thing which makes the Rosary so important in our spiritual life is that, for all too many of us, it is the only meditative prayer which we find ourselves making. There is a great temptation to confine our prayer life to reciting prayers which someone has written down for us—so many “Our Fathers,” so many “Hail Marys,” “Glory Bes,” and so on. We often forget to spend a few more personal moments with God, reviewing the favors He has granted the human race, and trying to understand His plan for our lives. What makes the Rosary different, is that the vocal prayers are, so to speak, pushed into the background, as we concentrate on the events of our salvation. We are given an opportunity to see God's generosity and love for us as we reflect on the fact that He chose to be born into this world in lowly estate, chose to suffer and die for us on the Cross, and conquered sin and death through His Resurrection. We can contemplate Mary's cooperation as we ponder her assent to the angel, her suffering in union with Jesus, and her glorious Assumption into heaven. In a sense, we are allowed a chance to be with Jesus and Mary, to witness the great things they have done for us. Now, in order for this to work, we must put some effort of our own into this prayer. We can start out by learning the mysteries or meditations -- there are only fifteen of them, and can be expressed in a word or two; “Annunciation,” “Visitation,” “Birth of Jesus,” “His Crucifixion,” and so on. But that is really just a beginning -- because knowing a word or two doesn't give us much material for meditation. We ought to become familiar with Scriptural and historical accounts which describe these events in greater detail. For instance, we can pick up the Bible, and read the first few chapters of St. Luke's and St. Matthew's Gospels, to get a fuller understanding of the events surrounding the annunciation, visitation, and birth of Jesus. Or, elsewhere, we can read about His Crucifixion, or His Resurrection. There are also good books which take the Scriptural accounts and organize them for each mystery of the Rosary. And, it should be our goal that our meditations grow in two directions. The should grow horizontally, encompassing an ever widening picture of our Lord's life—for example, our meditation on the Agony in the Garden might expand backward in time to include the Last Supper, and forward in time to include the events of our Lord's captivity throughout the night. Our thoughts on the Annunciation might include the Immaculate Conception. In other words, we should learn to meditate on the events which surround the designated mysteries—putting them in context, so to speak. Our meditations should also grow vertically—drawing us closer to God. They should help to gratitude for all the good things God has done for us, help to remind us that His awful suffering is the price that was paid for our sins, help to remind us that it is possible to live a life in conformity with God's will, as did the Blessed Virgin Mary. It should draw us more and more firmly into the family of God—reminding us that we are His children by adoption, the sons and daughters of His own Virgin Mother. Most of us have a Rosary tucked away somewhere—one that was given to us by a mother or an aunt, or one that we bought ourselves during the temporary burst of fervor at a mission, or one that we bought when we took a trip to a famous church and had to buy something as a “souvenir.” But a rosary doesn't do much good if remains in a lady's jewelry box, or stuffed behind the socks in a man's bureau drawer. It needs to be taken out, and prayed, and meditated upon. Some effort has to be made for it to be of value. But, the good news is that the effort isn't all that difficult. We have plenty of leaflets which list the prayers and meditations—and you probably already know a good deal about the meditations, just from listening to the Gospel readings on Sundays and Holy days. If you say no more than one decade each day, you will complete 73 Rosaries each year—one for each year of our Lady's life. And, once you start to make that effort, you will discover the very pleasant experience of coming to know Jesus and Mary better, and additional decades each day will become a pleasure, rather than a burden.